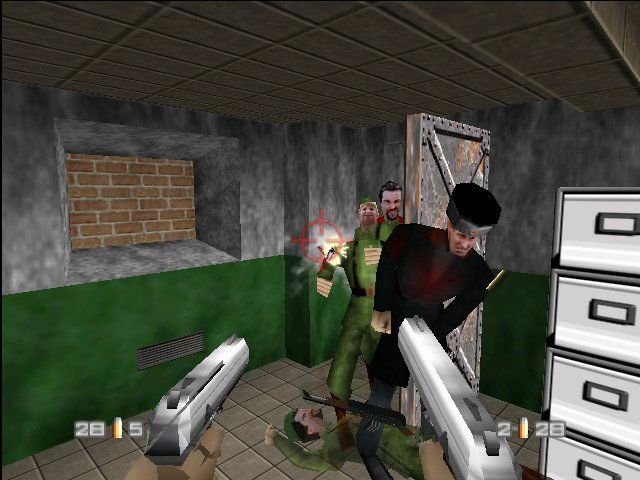 GoldenEye 007 is a first-person shooter that's exclusive to the N64. Your mission is to recover a combat helicopter and investigate a disturbance resulting from the GoldenEye weapon satellite. A huge range of weapons are available (e.g. RC P90 and Rocket Launcher), as well as a substantial set of gadgets (e.g. Watch Laser and Bomb Defuser). There's 20 levels and each requires you to complete all the objectives and locate the exit. The controls are great, with generous auto-aim, and I like that there's always plenty of ammo. The gameplay is chock full of memorable moments, none more so than in Facility where you aim down from the ceiling ventilation and discretely dispatch an enemy who's lurking in a bathroom stall! The ability to drive a tank in the Streets mission is awesome too, especially when you use it to mow down enemies and take out mines littering the road. Likewise, the Train mission adds some really nice variety by shedding the wide open spaces in favour of claustrophobic corridors littered with enemies. The Jungle level is equally intense, mainly due to the developers dropping the game's awesome music in favour of ambient sounds. Where the game falters is in its stealth missions, as enemies spot you immediately, even if you're carefully peaking around a corner. There's also lots of trial and error and a fluctuating frame-rate, and the short draw distance can result in cheap shots. However, each mission is enjoyable and I love how there's a greater set of objectives depending on the difficulty level chosen. The addictive Multiplayer mode has tons of options and it's impressive how well everything runs in split-screen mode, with hardly any slowdown. GoldenEye 007 is starting to show its age in some technical aspects, but that still doesn't affect its stature as both an excellent single player and multiplayer game. Its sheer size and scope is impressive, as is its top-tier level design, weapon range and controls, making for one of the best first-person shooters of its time. Random trivia: Despite selling over eight million copies, the game has never been re-released due to licensing issues.